Blackroot, photographed at Delaware Scrub Natural Area, Jupiter, Palm Beach County, in March 2015. Some plants have interesting or unusual foliage; some have interesting or unusual flowers. 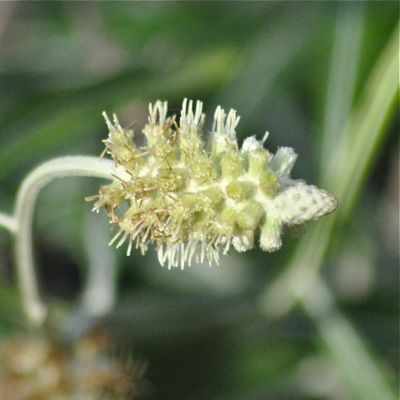 Blackroot, Pterocaulon pycnostachyum, has both. Blackroot is a Florida native found throughout almost the entire state. It's also native to most of the southeastern United States from North Carolina to Louisiana. 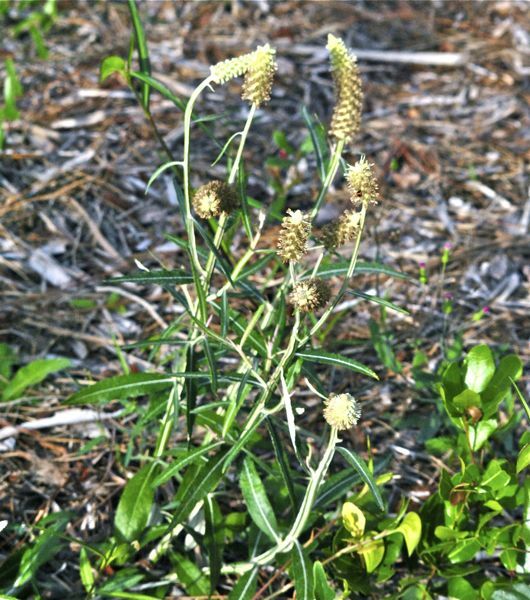 It's found in flatwoods and sandhills but can grow under a wide variety of conditions — moist soil and shade to dry soil and full sun. But what's most striking about blackroot is its unusual looks. The plant is a perennial and it is deciduous, meaning it drops its leaves at certain times of the year. It is an herb, capable of growing two feet high, multi-stem or single stem. The flowers are small but clustered on a strange-looking spike called a spiciform. Blooms are pointed and have a reddish tinge to them, especially at the tip and base. It flowers spring to fall. Leaves are lance-shaped, six inches long but less than a half-inch across. Above, they are dark green with a prominent white vein running down the middle. The undersides are hairy and gray-green in appearance. The leaf base doesn't end where it meets the stem like most plants, but rather runs down the stem, creating a striped look. Blackroot does, in fact, have black roots. They're tubers, similar to dahlias, sweet potatoes and some begonias. They store both nutrients and water, enabling the plant to survive extended dry periods. The plant contains coumarin, a chemical that gives plants a sweet smell. It's used in perfumes and fabric softeners, but it's also liver-toxic. If the word sounds familiar, it should. Coumarin is also an anticoagulant, and is the basis for the blood thinner, warfarin, sold under the brand name Coumadin. Coumarin is also found in a variety of rat poisons. The chemical has a bitter flavor, which might discourage some animals from grazing on plants that contain it. Blackroot is cultivated for use in wildflower and butterfly gardens, natural landscapes and restorations. 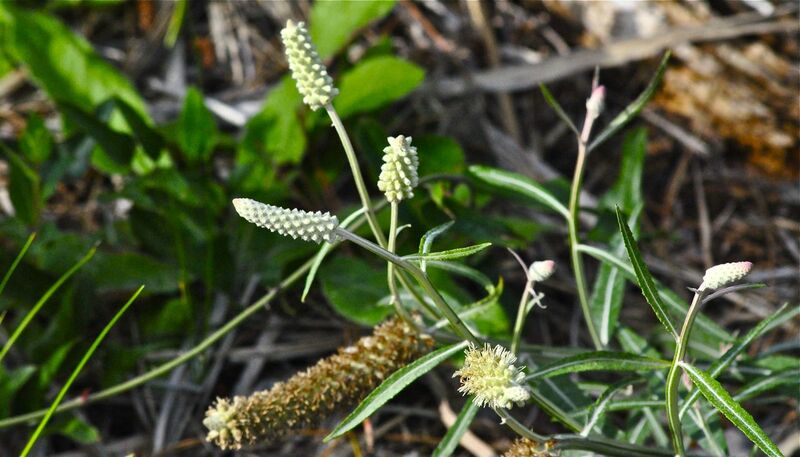 It is the host plant for the everlasting bud moth — the caterpillars eat the flowers — and is a nectar source for the gray hairstreak, whirlabout skipper and the zebra swallowtail butterflies. Blackroot is a member of Asteraceae, the aster family. Other common names include dense-spike blackroot, coastal blackroot and fox-tail.